Between one o’clock and two o’clock on the morning of 25 July 1943, more than 700 heavy bombers congregated over the port of Hamburg with the intention of erasing it entirely from the map. During the next forty minutes they dropped a record number of bombs for a single raid: 1,300 tons of high explosives blasted out the roofs and windows of thousands of houses, and a further 1,000 tons of incendiaries then set those houses ablaze. Within a short time most of the western quarter of the city was on fire, and the smoke was billowing up to 20,000 feet – as high as the planes themselves. The pilots, mesmerised by the sheer scale of what they had unleashed, later likened it to flying over the top of a volcano. On the ground, the German defences were in utter disarray: they had been blinded by a brand new anti-radar device that the Allies had employed tonight for the first time. Radar operators were telephoning each other in panic, flak gunners were shooting wildly into the air, and even the German night fighter pilots were weaving aimlessly across the skies. With nothing to guide them, they were reduced to peering through the darkness in the vain hope of finding the enemy bomber stream by chance. This was exactly the sort of effect the Allies had hoped for. Over the next ten days they returned to Hamburg half a dozen times, battering it repeatedly to prevent any possibility of recovery. For the first time, the Americans bombed in tandem with the British: the US Army Air Force attacked precision targets in the docklands by day, while the Royal Air Force continued to destroy the residential districts by night. It was ‘round the clock bombing’ in every sense of the phrase: on Tuesday they concentrated on the east of the city, on Thursday they bombed from the north, and the following week they attacked from the south. The results of this repeated bombardment were unlike anything the world had ever seen. The fires they created were so huge they burned for a month, and were visible for 200 miles. 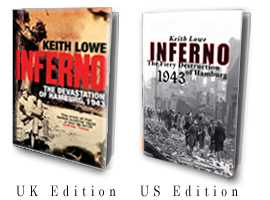 In the heart of the conflagration cars and trams melted and buckled on the streets, the roads became rivers of burning tarmac, and even the canals caught fire, the surface of the water having been covered in burning oil from hundreds of exploded boats. Tens of thousands suffocated in their air raid shelters, and the streets quickly became lined with the charred corpses of those who had tried and failed to escape the blaze. The devastation was almost total. Nearly two thirds of the city had been razed to the ground, with most of the remainder severely damaged. Only a tiny proportion of Hamburg’s residential areas remained unaffected. Disregarding the horror of it all, this was a huge achievement for the Allies, and an ideal that they continued to pursue for the rest of the war. A widespread belief grew up that if only they could reproduce these results in other cities then victory would be within their grasp. For the Germans, on the other hand, the event became a spectre that began to haunt every corner of the Reich. Rumours began to spread, carried by refugees, about the horrors that now awaited all German cities, and a new word entered their lexicon – Feuersturm (‘firestorm’) – a previously unknown phenomenon that quickly became every German civilian’s worst nightmare. From either perspective, this series of raids represents a turning point, not only for the air war but for the war in general. It was a moment in history when the very face of warfare underwent an indelible change. 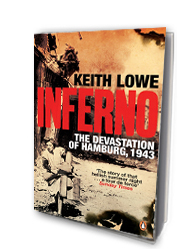 This is the story of how the bombing of Hamburg changed the city into a vision of hell; how the people who lived here fought their way to survival through hurricane force winds and temperatures of up to 800ºC; and how the disaster promised – but failed – to bring an early end to the Second World War.